AMMAN — Jordan will remain on the forefront of international efforts aiming to defeat the Daesh terror group, whether on the military or the ideological fronts, Foreign Minister Ayman Safadi said on Wednesday. During a ministerial meeting for member states in the global coalition to defeat Daesh in Washington, Safadi said that the Kingdom will continue to work within the framework of the coalition and the Aqaba Process on a holistic approach to combat terrorism wherever it constitutes a threat, noting that the ideology of terrorism does not belong to any culture or religion, and has no root in Islam, which is charictirised by peace and respect for the other. He added that the ideological defeat of Daesh requires refuting its narrative, in addition to resolving tensions stemming from desperation and injustice, the foremost of which is the Israeli-Palestinian conflict, in addition to crises in Syria, Yemen and Libya, a Foreign Ministry statement said. The foreign minister affirmed the significance of the victory achieved by Daesh over the extremist group, stressing the need for supporting Iraq in its reconstruction efforts, maintaining its stability and consolidating its victory against terror. He also stressed the importance of joining efforts to reach a political solution to the Syrian conflict, noting that stability is a key requirement for defeating Dash. Earlier in the day, the top diplomat participated in a meeting for the Small Group on Syria, which was hosted by US Secretary of State Mike Pompeo and attended by the foreign ministers of France, Jean-Yves Le Drian; Germany, Heiko Maas; and Saudi Arabia, Adel Al Jubeir, in addition to the UK’s Minister of State for the Middle East and North Africa Alistair Burt Egypt’s Ambassador in Washington Yaser Redha. The meeting was focused on efforts to end the Syrian crisis on the basis of UN Resolution 2254, and supporting the new UN Special Envoy for Syria Geir Pedersen to that end, according to the statement. Meanwhile, Safadi held separate talks on Wednesday with Pompeo on ways to develop the strategic partnership between the two countries, especially in the economic, trade, investment and defence fields. 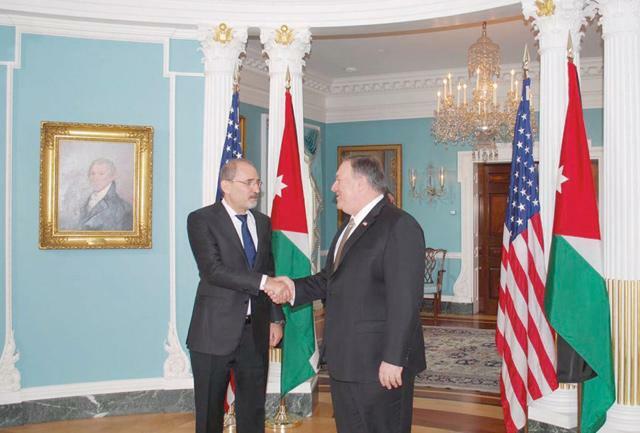 The top diplomats underscored the strength of bilateral relations and keenness to develop them further, with Safadi commending the US' support to the Kingdom, while Pompeo stressed the importance of the Jordan’s role in promoting security and stability in the region, and expressed the US’ commitment to supporting the Kingdom. The two ministers discussed a number of regional issues, especially the Palestinian-Israeli conflict, the Syrian crisis and the war on terror. Safadi pointed to the danger of the continued absence of prospects for resolving the Palestinian-Israeli conflict on the basis of the two-state solution, as the only way to achieve comprehensive peace. The two ministers also stressed the continued partnership in the war on terror and the need to upscale efforts to reach a political solution to the Syrian crisis. On the sidelines of the meetings, Safadi held discussions with his Moroccan counterpart, Nasser Bourita, during which they went over bilateral relations and regional developments, agreeing to continue coordination and cooperation on regional issues. Safadi also met with his Swedish counterpart Margot Wallstrom, with talks focussing on coordinating joint efforts to ensure the continued provision of necessary support to UNRWA, in order to enable it to fully provide its services to Palestine refugees in accordance with its UN mandate. Jordan and Sweden have been working intensively as part of an institutional partnership to bridge the financial deficit facing UNRWA. In another meeting, Safadi discussed with his Turkish counterpart, Mouloud Gawishoglu, the steps to be taken by both countries to build on the outcomes of the talks held by His Majesty King Abdullah and Turkish President Recep Tayyip Erdogan in Istanbul on earlier this week, especially in the field of boosting economic, trade and investment cooperation. The two ministers also discussed the situation in the region, especially those related to the Palestinian issue and the Syrian crisis. Safadi also met separately with UK’s Burt and discussed the preparations for the London conference to support the Jordanian economy, as well as bilateral relations and the situation in the region. The minister met as well Karim Khan, the special adviser and head of the UN Investigative Team for the Promotion of Accountability for Crimes Committed by Daesh in Iraq, and discussed cooperation between the Kingdom and the UN in combating terrorism.